John B. HAROUX or HARRICK/S b. m. d.
Eleanor aka Ellen TOTTEN formerly HORROCKS alias FALL b. 18374 m. 18705 d.
Albert aka Alberto Amado ZANONI b. 18626 m. d.
Note: Lena and Lily's biography has been written in collaboration with Caroline, Lily Alice ZANONI's descendant. Date of birth not known religion not known health good. Father not known mother sentenced on the 6th July 1871 for one month for being a common prostitute not able to support. The father has not been in Newcastle for many years, and it is not known whether he is alive or not. The mother is a notorious prostitute and has been several times convicted of offences at the Newcastle Police Court under the name of Eleanor Horrocks. She is supposed to be a Roman Catholic. The article How Arabs are Produced, recorded in the Newcastle Chronicle at the time of Eleanor's arrest, referred to the three children although they were not named.15 Because all three were very young at the time of their admission to the Sydney industrial schools and because they remained as inmates for years before apprenticeships were arranged for them at about the age of twelve, it is unknown how much of their family they remembered. It is unknown whether there was any contact with their mother, Eleanor, after their arrests. Descendants indicated that the two sisters remained in contact after they were discharged from Biloela but it is currently unknown whether any child was ever reunited with their mother. No trace of Alberto Amado ZANONI has yet been confirmed and the only references to him in NSW appear in the records of the Vernon. Albert ZANONI was identified as the father of both Lena and Alice on their death certificates. It may be that Albert also remained in contact with his sisters after his discharge from the Vernon as it is significant that this name had been recalled within the family, however his name may simply have been the only name the sisters could recall from their past. Lily Alice, Lena and Albert were the three children of Ellen TOTTEN and Vincent ZANONI. Their births were registered in Sydney but no marriage for Ellen or Vincent has been identified. It is likely that Vincent abandoned Ellen aka Eleanor sometime around the time of Lena's birth in 1865 and it is almost certain that she had very little choice in her decision to choose the occupation of prostitution to support her children after this abandonment. No death for Vincent has been confirmed. It is as yet unknown whether there is any connection to the Vincent ZANONI whose death was registered in Granville in 192220 and whose father was recorded as Camille. It is considered likely that this man may be in some way connected to the family but this can't be proven. This death may also record the death of Alfred ZANONI. Alternatively, it may also not be connected in any way at all. Eleanor ZANONI aka HORROCKS nee TOTTEN had arrived with her siblings and her parents, James TOTTEN and Eliza aka Elizabeth IRWIN, aboard the Cornwall in 1850.21 No details of Eleanor's life between her arrival and her 1870 marriage has been located in Trove or on the NSW BDM Index. James and Eliza eventually settled in the Bathurst area and Eliza IRWIN, died as Elizabeth in Orange in 1870.22 Also in 1870 in Newcastle, as Eleaner [sic] TOTTEN, Ellen married John B. HAROUX. No identification of John has yet been made but he may have been the miner of Wallsend who gave evidence in an arson trial in November 1873 as John HAROCK.23 In July 1871, the year after she married HAROUX, Eleanor HORROCKS was admitted to Maitland gaol for prostitution. Although it was stated that she was a known prostitute, this has been the first court appearance yet identified for her. Ellen's gaol admission for this offence provided the name of her ship of arrival. This admission, read in combination with the birth record for her daughter, Alice, which provided her maiden name of 'TUTING',24 was used to identify her family. In January 1872, Eleanor was working in a brothel in Wolfe Street, Newcastle, with Annie DEMARTIENE, the mother of Pasculine and Sarah25 and as Eleanor HORRICKS, in an article in August 1872, she was reported to be living with a George FALLS.26 Eleanor was still appearing in Newcastle court in April 1873.27 George FALLS very likely died in Sydney in 1875 at the age of 32.28 No further trace of Ellen or Eleanor has been found after 1873 and her final residence is unknown. It is unlikely that she died as Ellen HERRICK in Orange in 1900 as there was already a woman in Orange of this name who was having children at about the time of Eleanor's arrival. This death registration29 was still unusual as it recorded no parents or age on the online index. Family Notices in Trove suggested that this woman's daughter, Ellen, had died in 1886. No death registration for this Ellen has been found and it is unknown whether she died as HERRICK or whether she was the Ellen HERRICK who married Patrick MEEHAN in 1881. Winifred Z. CARTER b. 190040 m. 192441 James C. McGARRY d.
Nellie M. CARTER b. 190242 m. 192443 William KIRKLAND d.
Lily Alice Florence ZANONI was the elder of the two ZANONI sisters. She was apprenticed first on 23 October 1877, when she was apprenticed for six years to G. W. F. ADDISON, the Police Magistrate of East Maitland.48 On 4 February 1880, Lily's younger sister, Lina, was also sent as an apprentice to ADDISON. The arrangement of having the two sisters as apprentices must not have been successful as Lily's indentures were cancelled and she was returned to Biloela on 12 May 1880. On 31 July 1880, Lily was apprenticed for three years and three months to Mr T. DEIGHTON of Orange and the register noted that she had completed these indentures well.49 The choice of the locations of these apprenticeships may not have been coincidence and there may be correspondence available confirming some familial connection in the East Maitland or the Orange areas because Orange was where her maternal grandparents were known to have settled. Lily Alice went on to marry Edward CARTER in Lithgow on 17 October 1891. The couple had six children.50 Alice died on 17 November 1932, and was buried as Lillian CARTER in the South Bowenfels Cemetery.51 An appropriate death registration for Lily has not been located by her family. Edward CARTER died in 1947. Roy Earl BLANCH b. 190860 m. 194761 Lila Rosamine STEWART d.
Ellen Lina Annie ZENONI was known as Lina. Her birth was registered in 1865 so she was the younger of the two ZANONI sisters. Lina was apprenticed for six years on 4 February 1880, when she joined her older sister as an apprentice to G. W. F. ADDISON, the Police Magistrate of East Maitland.62 It was often a deliberate decision to place siblings close to each other but this situation appeared to have been unsatisfactory for ADDISON as the older sibling, Lily, was returned to Biloela and only Lina remained in East Maitland. These indentures were subsequently cancelled with the consent of all concerned and Lina's apprenticeship was transferred to Mrs Selina PALMER of East Maitland. The Biloela Discharge Register indicated that Lina completed these indentures well. Lina went on to have three illegitimate children. Two died in infancy and one was born shortly before her marriage in 1898. In 1898 in Singleton as Lena E. ZANONI or ZANONIE, she married Frederick BLANCH. Lena and Frederick had two further children.63 Frederick was buried on 14 April 1919. 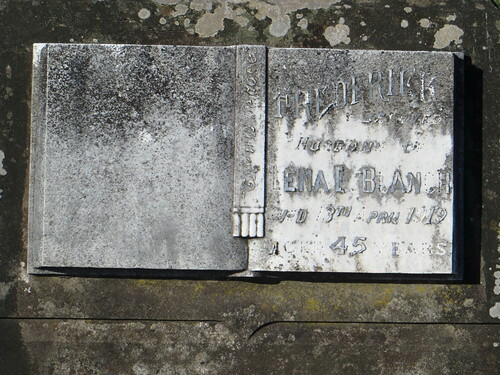 Lena Ellen BLANCH died in Wallsend, near Newcastle in 1952.64 She was buried with her husband, Frederick, in Sandgate Cemetery, Newcastle, on 2 August 1952, at the age of 83.65 While they share the same grave, Lena has no inscription on the headstone. 31. NSW Birth: 3336/1887: could this birth have been registered as Florence JOHNSON (3413/1887) in Sydney a short time later? 44. NSW Birth: 24480/1905 ‒ as Ray C. ‒ Mother: Lily A.